The SL Buddy Walk is not only a fantastic music event, it’s also jam packed with exclusives and special edition items on sale to raise funds for this great cause. I’m wearing a darling warm weather denim tube dress from Sang Style, with an old fashioned rose print and denim ruffles. It’s a great fit with lovely detailing. Please make time to attend this event for such a worthy cause — check the website below for information on the entertainment schedule as well! My shoes are from Redgrave, a great bargain too — 12 customizable colors via HUD for the price of one pair! My updo is from Truth. Cold Winter Nights Hunt — Don’t Miss Out! I have some more goodies for you from the Cold Winter Nights Hunt! I’m still in awe of the designers for the prizes they have created for this hunt! They really put their hearts into making fantastic gifts for the hunters! If you are feeling a chill, you will adore the darling mesh coat prize from Le Forme! The prize includes a variety of sizes to help ensure you are able to snuggle comfortably into the warmth. Also shown in the photo is the lovely Nuiko skin from Amacci! The skin prize includes the natural skin and a “cold nose” version! There’s nothing like curling up at home after a hard day of shopping and hunting! Of course, after you find the items in the photos, curling up at home will be a lot more enjoyable! 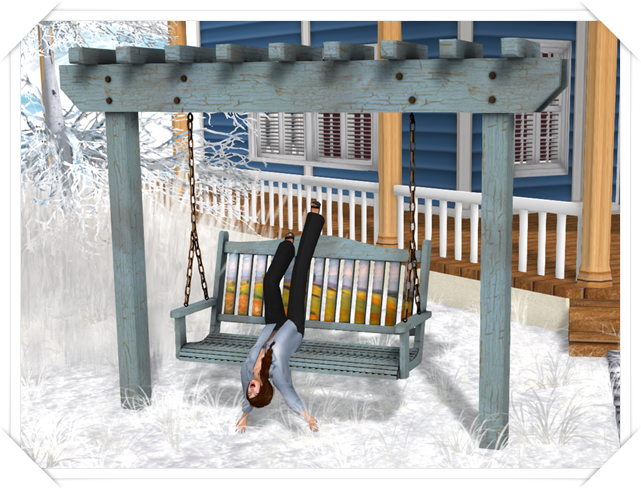 You will adore the poses from Demise of Flight! The poses will make taking photos in, and around, your new home from RighTone a breeze! 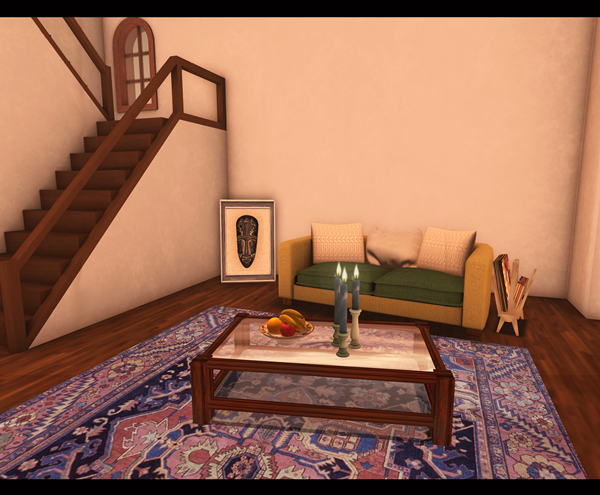 Barnsworth Anubis, Trompe Loeil, and Little House of Curios made decorating a pleasure by providing the beautiful fireplace with candles, inspirational wall hanging, and the adorable reading nook as prizes! The reading nook includes the chair with sits, star wall hanging, and the shelf with many charming, decorative items. The swing, created by Michigan’s Shack, is a very impressive prize! The mesh swing has wonderfully created single, cuddle, and friend animations which can be changed via the menu. I love that the animations also include expertly created facial expressions! If you have not started hunting, you still have plenty of time! The Cold Winter Nights Hunt does not end until February 15th; however, don’t delay too long because you don’t want to miss out on any of the prizes! So yesterday I had asked Ally and Ada to do a blog picture with me with the newness that was at Coldlogic. So this is how it turned out. Now mind you my computer was absolutely not cooperating yesterday which the girls helped me out by taking the group picture for me and its coming out today because the rest of the pictures I had to take today when my computer wasn’t being a douche! So anyways, y’all keep checking back to Ally’s blog when she’s done her side of her outfit! Did you know that there is a pretty awesome hunt that just started? It’s called the Cold Winter Nights Hunt and it’s brought to you by Goofnutz Events (housed under Prism Furniture). This hunt centers around the cold winter nights that make us want to curl up and enjoy the warmth of our fires and beds. What you’re looking for is a little blue snowflake, and for 10L you can get amazing items such as this Fireplace with Candles from [barnesworth anubis] and from Trompe Loeil and gorgeous shelf with framed Imagine Quotes. Make sure to check the Cold Winter Nights Hunt blog and all the designers participating. The hunt goes from January 15th through the 31st and starts off at Prism Furniture! Happy Hunting! As the start of the Cold Winter Nights Hunt approaches, I’m giving another preview — a gorgeous mesh sweater from PurpleMoon that is a CWNH exclusive! This mesh boucle knit sweater is trimmed in narrow satin at neckline & hems, and features a wonderful pompom frill. To complete my outfit, I’m wearing a sassy little leather mesh skirt from NS, sheer colored tights from Izzie’s, and a pair of awesome mesh boots from ArisAris. These are texture changing via HUD and give you an amazing variety of options, from colorful to sedate. I’m warming myself in front of a beautiful fireplace & mirror set from Prism Furniture. 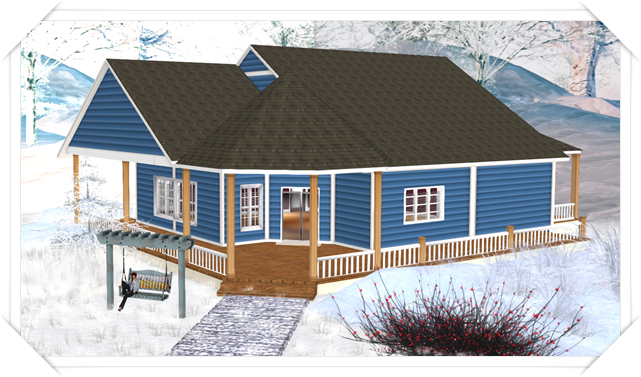 This is part of the Seattle Mountain Cabin build … see my previous post for more detailed information about this beautiful home! Look at the rich texturing of the sweater, it looks soft and warm! I love the blue/brown color combination, too. My beautiful copper jewelry set from Stars! compliments my outfit perfectly! I’m wearing a little makeup from MOCK, mesh lashes from Gaeline Creations, and a Truth updo. A GoofNutz event. General information, hints, and photos! Prism Furniture – Seattle Mountain Cabin Fireplace & Mirrors *Thank you for the awesome blogger gift! Carpet – My build, not for sale. Jewelry: Stars! – Fatuma Set *Thank you for the awesome blogger gift! Top: PurpleMoon – Pom Pom Mesh Sweater Brown (CWNH exclusive!) *Thank you for the awesome blogger gift! Skirt: NS – Brown Mesh Leather Mini Skirt *Thank you for the awesome blogger gift! Shoes: ArisAris – Multitexture Envy Boots *Thank you for the awesome blogger gift!